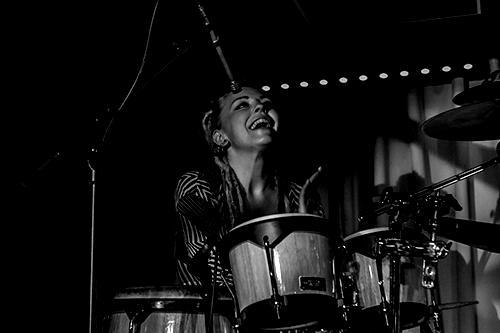 Vicky O’Neon is an award-winning drummer and percussionist from the prestigious Tech Music School (aka BIMM) in West London. She has taken her drumming skills all across the globe and tours extensively with different artists internationally and in the UK and has studied one of her favourite genres, Latin Music, under several occasions in the Caribbean. Performance credits includes Pharrell Williams, Johnny Marr, Hans Zimmer, Nate Watts, 02 Shepherd’s Bush Empire, Milton Keynes Stadium, Madejski Stadium, Elle Style Awards, The Hammersmith Apollo, Zhangbei Festival (one of China’s biggest music festivals) to name a few. Vicky is a TV personality in Finland with appearances including a documentary made about her named “Girlpower” in 2014. She has received a one-year working grant for musical activities to develop her artistry from the Swedish Cultural Foundation in Finland. She is also a Premier endorsee and ambassador for female musicians and have developed a custom-made kit as a part of the award-winning series Modern Classic. Vicky’s wild colours, high-energy and passion for music is guaranteed to blow any groove lover away. “I’m very proud to be playing alongside some of UK’s most talented musicians in High On Heel’s collective of DJ’s, vocalists and instrumentalists”.